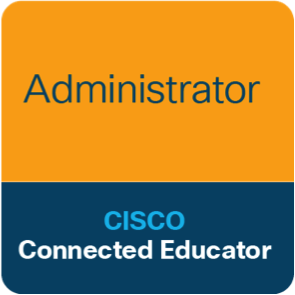 Become a Cisco Connected Educator through CILC! Cisco Connected Educator Badge Curriculum is specifically designed to empower educators with high-quality collaboration tools to foster innovation and creativity in today’s digital learning environments. 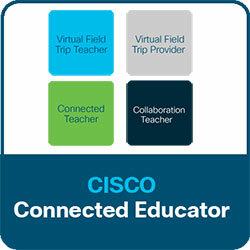 A major component of the Cisco Connected Educator program provides a Professional Learning Network (PLN) in which members, through the use of the Cisco collaboration application, Webex Teams, belong to individual learning communities to share and discuss best practices pertaining to their teaching with collaboration technologies. 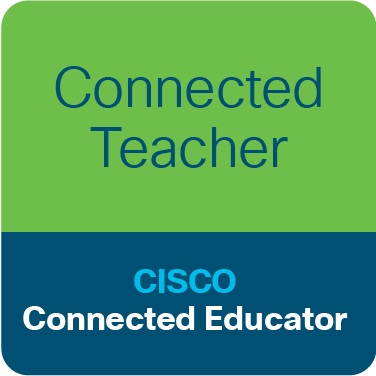 The PLN will provide support to educators as they work on any one of the Cisco Connected Educator Badges. The program provides badges for teachers, content providers, and administrators and researchers who demonstrate their ability to use world-class video and collaboration technologies for better teaching and learning, content creation, administrative management, and research. 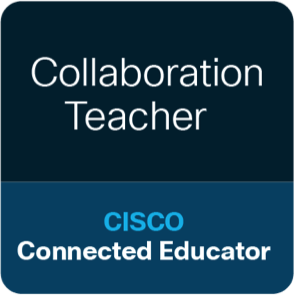 Teachers, students, administrators, and researchers earn Cisco Connected Educator badges by demonstrating their ability to use collaboration tools in their learning environments. They provide evidence of this ability in the form of written documentation and video artifacts of their experiences. CILC will award Badge recipients with a one year Cisco Webex license with full capabilities for multipoint video meetings, file sharing, messaging and recording. Earn a badge that you can post on your digital assets to show the world your accomplishment in the areas listed below. Earn a Badge and receive a one-year Cisco Webex License! 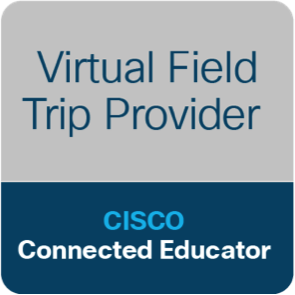 In the Virtual Field Trip Community, CILC members discuss teaching and curriculum strategies as to the use of Virtual Field Trips. This community will also provide an online community in which teachers can share feedback on the value and impact to the learning that their students experienced with a Virtual Field Trip (VFT). 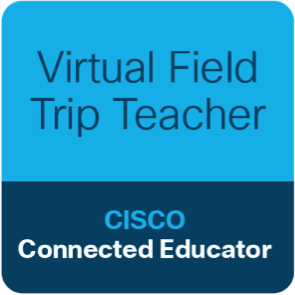 Members will learn about successful virtual field trip engagements and receive support as they work on the criteria for the Cisco Virtual Field Teacher Badge. Collaboration technologies enable educators to expand the walls of your classroom to another classroom outside of your geographic boundaries. Real-time collaboration to deliver and facilitate learning objectives empowers educators to perfect their practice of teaching while providing learning opportunities for students that enable higher-level thinking and broaden student perspectives and empathy for others while using digital tools. Content Providers committed to sharing knowledge and expertise via videoconferencing and collaborative technologies are vital to expanding the walls of today’s classrooms to the world beyond. Educational programs at museums, zoos, historical landmarks, and authors are just a few examples of the content providers that offer standards aligned educational content to classrooms. In content provider settings, the challenges of the environment allow for the discovery of new practices and affordable technologies needed for optimal connections to classrooms. Classroom teachers are continually looking for ways in which to personalize and meet the needs of students while staying connected to them during all aspects of the learning process. Teachers explore the use of collaboration tools to message, call, whiteboard, and file share while creating dynamic spaces for students to engage with the curriculum and their classmates. The Administrator Badge is a badge for a school administrator who demonstrates visionary leadership through the use of collaboration applications within their administrative environment.